There are many egg recipes that are great for on-the-go meals or simply for great brunches or breakfasts. My hubby has a sweet tooth and so does one of our girls. As a result, they love to have some type of sweet element in a lot of their meals, especially breakfast. How do you have something sweet with eggs? Maple Scotch Eggs, the mouth-watering combination of eggs, pork and Canadian Maple Syrup – yum, yum! The first step is to get hard-boiled eggs. Here is how I make my hard-boiled eggs perfectly. Shell the cooled eggs and set them aside. Next mix the ground pork, maple syrup, basil, rosemary, garlic and oregano in a bowl. Divide the mixture into 4 quarters. Make a thin patty with each quarter of the ground pork mixture and wrap each mixture around an egg till the egg is completely covered. Brush the “meat eggs” in the olive oil and place on a cookie sheet and bake for 30 min or till desired brownness. Once out of the oven you can drizzle some additional maple syrup on the scotch eggs if you so desire. These were a great hit with our daughters. They are great for a snack or for breakfast. They can also be eaten cold as leftovers. Originally, scotch eggs were meant to be bar food in Europe, but have migrated to our home in Manitoba, Canada where we enjoy them very much. The original scotch eggs are also known to be breaded and deep fried. 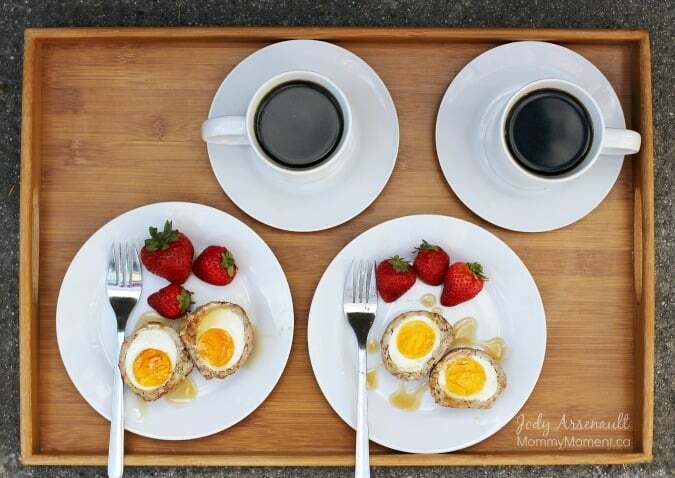 Our Maple scotch eggs are a healthier alternative and a great way to start the morning off right with a healthy dose of protein. The sweet factor is an instant hit. Give them a try and you won’t be disappointed. Disclosure: This post was brought to you by Egg Farmers of Canada via Mode Media Canada. The opinions expressed herein are those of the author and are not indicative of the opinions or positions of Egg Farmers of Canada. 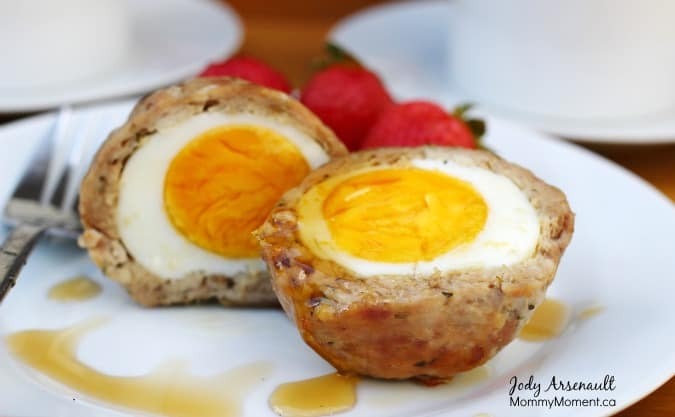 OMGosh Jody, I have never heard of scotch eggs before, but that sounds truly delicious, particularly by adding maple syrup to them! 🙂 Thanks so much for the inspiration, I can’t wait to tries these next weekend. I absolutely love these, I hope you enjoy them as much as we do. Mmm! Oh my gosh does that ever sound fabulous! I definitely would be up for more maple syrup on top too. Wow, not only are your photos gorgeous but this looks AMAZING. I’ve never had scotch eggs before, I actually just learned about them recently. They look amazing! Thanks Jeanine, I have been trying to improve my photos so your comment made my day. I hope you love them if you decide to make them. Yum! I am always looking for great, new breakfast recipes. We always end up eating the same few meals. Oh my, my mouth is watering just reading the recipe, I do so love maple anything. Very interesting! Not sure I would like them, just because I’m not a fan of eggs..but some people in my family might really dig this. Maybe I’ll make it for them sometime, as I eat a bowl of cereal lol. This is something new to me but they really look delicious. I will have to try these one of these next weekend so that when I make them for company, I know what I am doing. They really do look amazing. This looks like a fun recipe for special occasions! These look amazing! I’ve never heard of this recipe but it’s a must try. absolutely brilliant!! wow do these ever look good. totally bookmarking this cause I am giving this a go! thanks for the recipe ! Oh, how creative! My hubby especially would love these! I’m sitting on the fence with this one. I’ve never thought of doing this to eggs. This is a really interesting variation of the traditional recipe and I have to say yours look and sound much more appealing! I would love to try these, I love eggs but they can get boring, this sounds like a great recipe and it’s easy too!! have heard of these, but never tried them, now may be the time! They look delicious and I’d even eat them for dinner! Wow, I’ve never heard of this before! Sounds very interesting! I bet it tastes good!!! That looks delicious! I’ve always wanted to try making this! This looks soooo delicious. I’ve never heard of anything like this before. 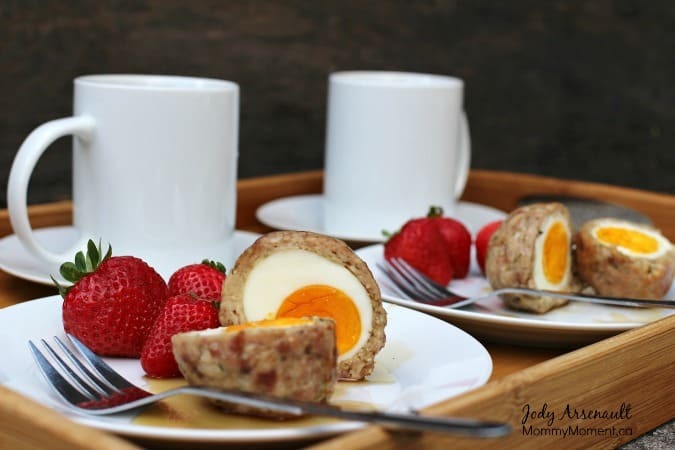 OMG, I love Scotch Eggs and haven’t had one since I was last in the UK, will have to give this recipe a go! Scotch eggs with Maple syrup it’s new for me! Thanks for sharing! My mom used to make these when I was a kid. I’ll have to give it a try! I have never heard of these before- I’m definitely going to try making them. What! This is a thing?! How cool!! I am gonna try it! I want these for breakfast. This would go over very well in this house. I’ll have to make these for my Dad. Thanks for the recipe!